When we return after the Christmas break, these are some possibilities for re-entering my studio practice. Our shared studio space at Dartmouth Avenue is crowded for the First Year part-time students. While I am certainly grateful to even have studio space there, we are elbow-to-elbow and vying for every square centimeter of wall. Dartmouth Avenue MA Fine Art part time Year 1 studio. Image: Kelly M. O'Brien, 9 December 2017. A few weeks ago I started to feel really hemmed-in and actually encroached-upon by my neighbor to the left. I responded by drawing a pencil grid right up to, up over, and beneath sheets of sketch paper she had taped on top of my own work. Each time I returned to the studio, there was another small act of passive aggression by her work, to which I responded in kind. It felt like a bit of a dance or game, but also an act of self-preservation. A colleague revealed the artist's identity to me last week. My intention was to playfully call both of us out and explore the dynamic emerging through our work. Since I hadn't run into her at Dartmouth, I was hoping we could start the conversation during Open Studios. She didn't attend, but when I walked into the studio to finish my preparations midday Wednesday, her work declared its presence boldly and emphatically right next to mine. It was then that my growing instinct to occupy the studio crystallized. I now have the urge to creep my installation up walls, across the ceiling, and into spaces that others have not claimed. Will this be a friendly occupation or hostile? Can torn paper fragments and thread even be aggressive? And what does this say about my desire to connect when my actions are to claim presence? Kelly M. O'Brien, work in progress during Open Studios. Bath Spa MA Fine Art Program, Dartmouth Avenue studio, 6-7 December, 2017. The response from viewers during Open Studios was fascinating and informative. Some found my work to be quietly thoughtful, delicate and vulnerable. Others read it as map-like, colonizing and even encroaching. The most consistent and surprising response? How well my neighbor's work to the left and mine worked together and that there seemed to be a real dialogue happening between them. A few people even thought the combined work was by one artist. After meeting with Michelle and Andrea for the RM tutorial, the ideas have started flowing for small tests and models I want to pursue in the studio. O'Brien, K. (2017) 'Thread and frame studies', Research Methodologies. Bath Spa University. Unpublished sketchbook. O'Brien, K. (2017) 'Tape studies', Research Methodologies. Bath Spa University. Unpublished sketchbook. O'Brien, K. (2017) 'Paper studies: felting machine', Research Methodologies. Bath Spa University. Unpublished sketchbook. O'Brien, K. (2017) 'Cable tie studies', Research Methodologies. Bath Spa University. Unpublished sketchbook. At Dartmouth Avenue there is a vintage industrial felting machine in the mixed media textiles studio. It is traditionally used to felt two pieces of textiles together, but all I could think of was running all kinds of paper through it! Vintage needle felting machine, Dartmouth Ave. mixed media textiles studio, Bath Spa University, 30 November 2017. My interest lies in testing techniques to create degrees of opacity and translucency with manipulated paper. Piercing paper has been part of my practice through the use of a sewing machine to stitch images and sheets together. Patterns made in the paper as light shines through the piercings have been an unintended but welcomed outcome. I wanted to see what happens with a less designed approach by simply allowing hundreds of needles to transform the paper. Would it be possible to get a more organic or at least abstract result using this machine? Since this was a spontaneous set of tests during my induction to the machine with Stephen Daniels, I used three types of paper that I had on hand: sketchpad, vellum, and acetate. They had to be taped end-to-end to form a long enough sheet to safely pass through the needle bed. O'Brien, K. (2017) Pierced paper tests: sketchbook paper, 30 November 2017. 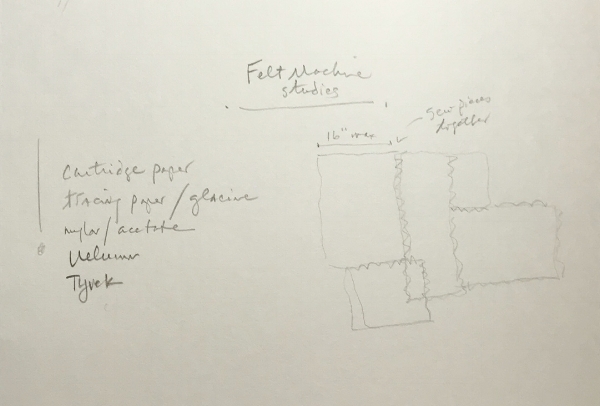 O'Brien, K. (2017) Pierced paper tests: sketchbook paper (detail), 30 November 2017. 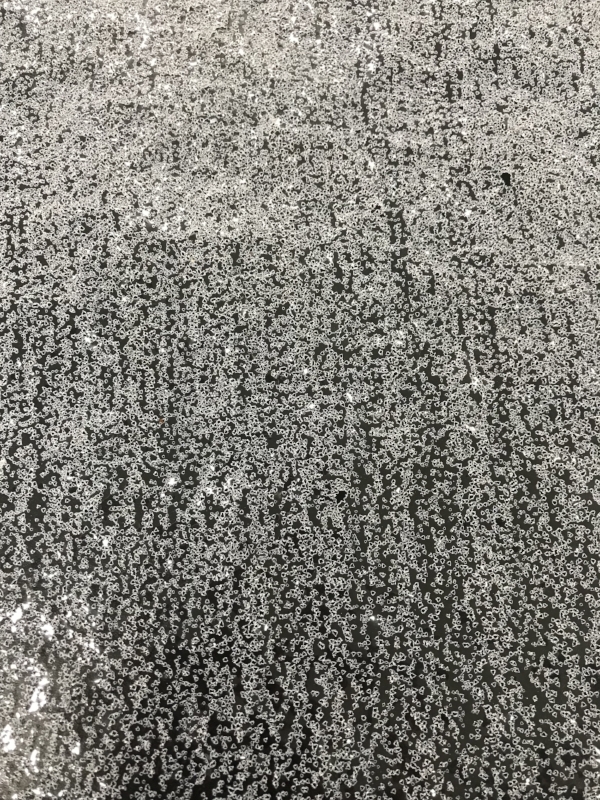 O'Brien, K. (2017) Pierced paper tests: vellum (detail), 30 November 2017. O'Brien, K. (2017) Pierced paper tests: acetate (detail), 30 November 2017. This is a promising start. It seems there is potential to create the effects and feelings that I seek: translucency, veiling, delicacy, vulnerability, impermanence. These initial results are satisfying, so I will continue in this vein. 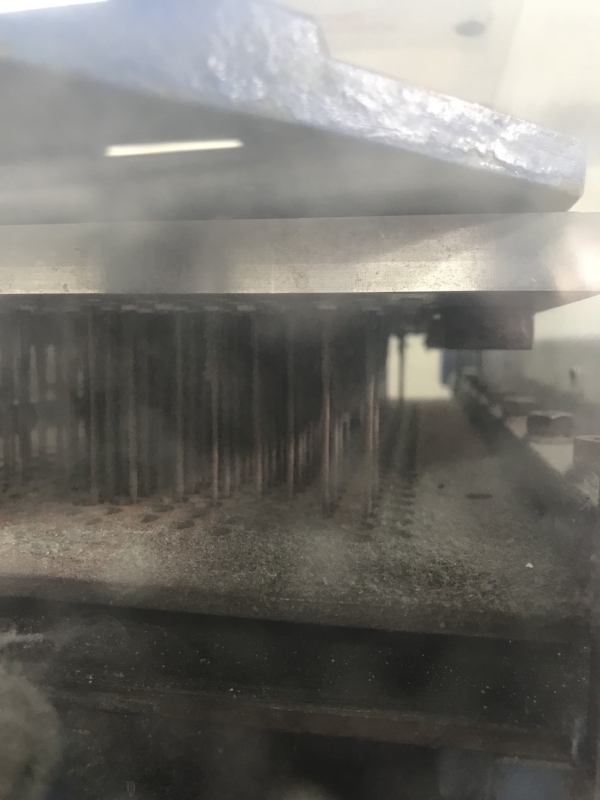 I am also surprised by how beautiful the destruction is from thousands of needle punches, and excited about the potential and application to my work. :: supports and frames—how will I install, suspend, drape, hang and otherwise make use of these materials? Surprisingly, it has taken me until today to actually get some work started in my on-campus studio at Dartmouth Avenue. Nearly nine weeks into the term! We were told there's no hurry, that next term we "re-enter" our studio practice officially, after this term's intense focus on research. We've also been told to just get into our studio space and experiment - that it's in doing the work that we'll uncover our new direction. All of which has felt like contradictory advice and has left me feeling like a deer in the headlights, temporarily frozen. Kelly M. O'Brien, work in progress. Bath Spa MA Fine Art Program, Dartmouth Avenue studio, 18 November, 2017. But I know from experience that the longer I hesitate, the harder it really is to begin again. So today I picked up where I left off in September for our group exhibition in Germany and recreated a partial version of my Mending | Tending wall installation. Although it's something I've done once before, it will always be different. Kind of like moving into a new home - my belongings are the same from the previous house, but they look completely different in the new space. Surrounding myself with familiar objects and materials is grounding, comforting. It will feel like home after awhile, but not right away. Kreuzer, M. (2017) Home in the re-making: Immigrants' transcultural experiencing of home. Journal of Business Research: Elsevier, Page 6, fig. 2. Shared consumer experiencing of home. 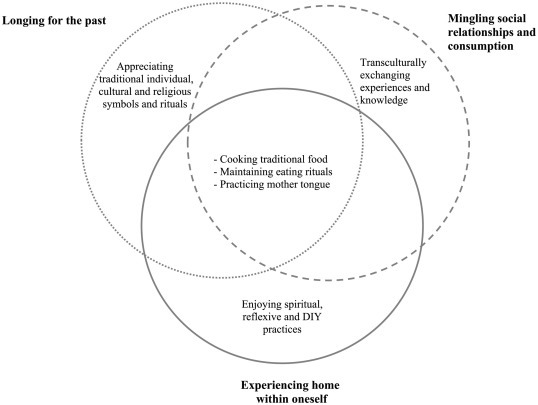 In a recent paper, Home in the re-making: Immigrants' transcultural experiencing of home (Kreuzer et al., 2017), Maria Kreuzer and her colleagues found three different ways that immigrants experience home: 1) longing for the past, nostalgic for what they left; 2) mingling new relationships with old and new ways of consuming (products, food, etc. ); and 3) experiencing home within oneself, supported by new close social relationships and an independent sense of groundedness and wellbeing regardless of location. I can relate to all of these, with the latter being the most satisfying and beneficial to my wellbeing. What portion of the students in my MA program are from overseas or have relocated within the past three years? How do they define or experience home? What does home mean to them? What helps them feel at home here? What role does their participation as a student at Bath Spa play? Kreuzer, M. (2017) Home in the re-making: Immigrants' transcultural experiencing of home. Journal of Business Research: Elsevier. Available at: https://doi.org/10.1016/j.jbusres.2017.10.047 (Accessed: 13 November 2017). My first tutorial with Andrea Medjesi-Jones was yesterday. I jumped on the opportunity to meet with her as soon as possible to get a read on where I am in these early weeks of research. Five weeks into this program, let's say I'm feeling consciously incompetent (better than unconsciously incompetent). It's an uncomfortable place to be, although I realize that if I ride out the void of not knowing where my practice is heading and related anxiety, things will change. We're way too early in the process—scaffolding, as Michele Whiting reminds us—to be putting lids on things. Getting inspired in my shared studio space at school: mind maps of my current thinking surrounded by work of major installation artists relevant to my research interests. That said, the mind maps that I've been doing are helping me see some emerging patterns. Within my area of focus (installation art), the themes that I'm interested in investigating remain pretty consistent (dislocation, home, belonging, impermanence, loss). 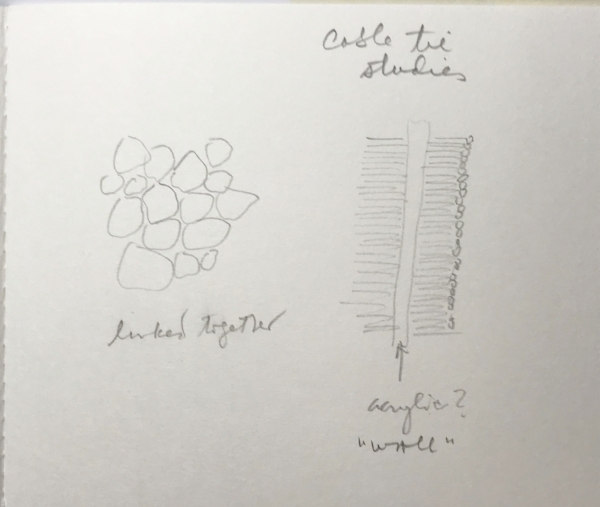 The artists' work to which I'm drawn share similarities in materials (mixed media, easily-obtained materials, ephemeral, temporary, a certain sense of delicacy). And their processes appear to share things like accumulation, amassing, assemblage, casting. Talking with Andrea affirmed that I'm on the right track and to keep going. To stay open, be curious and not be so quick to discard an idea. When I brushed off the enlarged mind map that I had installed on the studio wall (for lack of anything else at this point), she caught it and said she could see the patterns and colors ending up in my work. I don't take that literally, but do see her point. A significant insight occurred while talking with her - a moment of reflection-in-action (Gray, 2004). I was describing how starting this degree feels like relocating to a new country, which I've done twice in the past six years. All of the themes I'm working with are relevant: feelings of dislocation to a new, unfamiliar studio; a sense of the ground shifting beneath me; loss of what I've comfortably known; a yearning to feel "at home"; wanting to belong; looking for a "way in" but not knowing how to start; and a sense that this is all moving quickly - the impermanence of any given state. This finite period of "relocating" my art practice is a special time when senses are heightened and the eye notices everything because it's new and unfamiliar. In that moment, I realized that I can use this experience in my research. It's not clear to me yet what that specifically means, but I am aware that I want to pay attention, capture, and use how I navigate these early weeks and months. My installation art practice will recreate these conditions with every new site (in the studio, for an exhibition, during a residency), as discussed in my last blog post on impermanence. It suddenly seems paramount that I understand and somehow codify this stage of the game. If I can create a map for the journey now, maybe I don't need to completely reinvent the wheel each time I approach a new installation. Or at least I'll get less lost (Godin, 2017). After all, I've gained knowledge, skill, and created a repeatable process on how to do an overseas move—not only the checklists and tasks, but also how to say goodbye, let go, look around, find my tribe, and land well. :: over time, notice the patterns—what is emerging? what is repeatable? what might be helpful next time around? Gray, C. and Malins, J. (2004). Visualizing research: a guide to the research process in art and design. Aldershot: Ashgate. Godin, S. (2017) 'The thing about maps', Seth's Blog, 30 October. Available at: http://sethgodin.typepad.com/seths_blog/2017/10/the-thing-about-maps.html (Accessed: 30 October 2017).